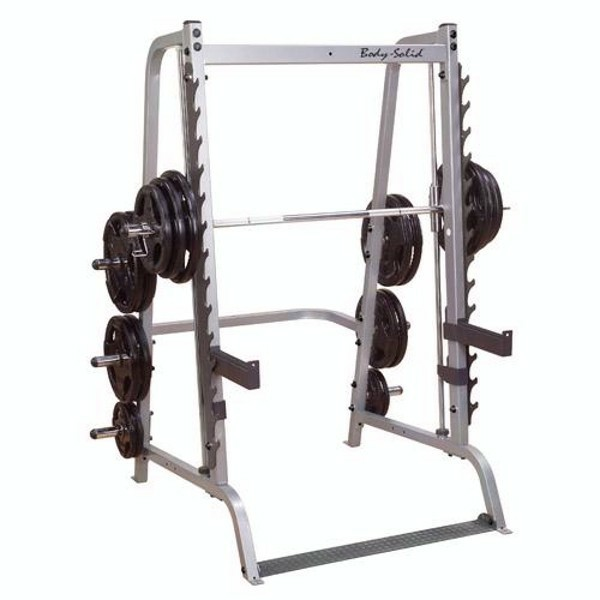 Set to a 7-degree reversed pitch, the Series 7 allows natural upper and lower body movements for maximum muscle interac- tion; a feature not found in the traditional Smith Machine. User safety is provided by 20 cross-member lock-out points that are accessible with a simple 15-degree rotation of the bar, eliminat- ing the need for a spotter. For those exercises that demand freeweight movement, the 14-position gun rack with 17" extra heavy duty safeties is also set to a 7-degree reversed pitch providing convenient lift-off points and predictable racking. The Series 7 works great with any bench for intense chest and shoulder routines. Add the optional Selectorized Lat Attachment for high and low cable exercises, lat pull-downs, triceps press- downs, cable crossovers and much more!